I recently picked up a Sangean ATS-909X to use as a bedside radio. Great video, Marty, and thanks for the thorough review! You can follow all of Marty’s videos on YouTube by visiting this page. This entry was posted in AM, Mediumwave, News, Radios, Reviews, Shortwave Radio Reviews and tagged ATS-909X, Marty (W5MRM), Sangean, Sangean ATS-909X Review on September 29, 2015 by Thomas. Nice review regarding the 909X as a bedside radio. I’ve had the radio for six months now but haven’t used the timer or alarm functions. I keep another old Sony bedside radio in the bathroom as an alarm clock: which forces me to get out of bed for a shower if I want to turn off the loud radio. I’m very good at turning off bedside alarms in my sleep. Luckily, I don’t sleep walk. I use the 909X away from the bedside and do a lot of SWLing with the Sangean ATS-909X, mostly late afternoons and evenings with a 106′ random/long wire antenna. You mentioned that the 909X does not have a sync detector for SW. This is a true statement. 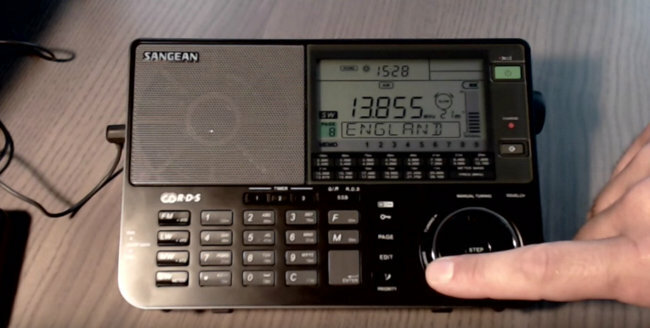 However, you may like to try using ECR (exalted carrier reception) which is also called ECSS (exalted carrier selectable sideband) with the 909X. This tuning method reduces the effect of fading, noise and blasting on weaker signals rendering the station more readable. I find ECR to work better than sync functions found on portable SW receivers. Tune your SW station using AM and the wide IF filter (6 kHz). Now switch to USB (the 909X will automatically switch to the 4 kHz narrow IF filter for SSB), turn up audio gain a quarter to a third turn, switch to slow tuning and zero beat the station. Voices will sound close to normal when correctly tuned. You may further clarify the signal by using the audio filter settings or switching from USB to LSB and re-tuning to make use of the other side band. You might be amazed at the audio quality and quiet signal the rock solid 909X provides with ECR. I’m having fun with the 909X and leaving now to listen to BBC in English via the relay at Ascension Island. It’s coming in great here in California at 7445 kHz from 0500-0600 UTC. Good analysis, Marty! I use a Sangean WR-22 receiver as my bedside radio. It doesn’t have shortwave and nowhere as portable as the ATS 909X, but it does have a ton of features. In addition to AM and FM RDS reception, there is aux audio (like the 909X) and Bluetooth. You have a smartphone, tablet, or similar devices, you can stream content from a variety of apps. I primarily use it to hear podcasts and stations streaming on TuneIn Radio and other apps as I go to bed. Audio quality is superb as well. Thanks for the great review Marty. I have had my eye on the Sangean ATS-909x for a while but there are too many reviews claiming the radio is deaf using the whip. I’ve considered buying a modified ATS-909x from Radiolabs (ClearMod) but at $289.95 I have to think twice given I have several radios already. I would be interested if you have the time in your thoughts on sensitivity between the Sangean ATS-909x and the Tecsun PL-880. Have you noticed any sensitivity issues using the Sangean ATS-909x? I’m a few years after Steve’s comments but I will have a go at it, at least anecdotally speaking. I’ve owned a half dozen Sangean ATS-909’s, which includes two of the 909X’s, and one super-909 from radiolabs. The 909X is the finest looking portable I have ever seen or lain hands upon, and that includes several Sony’s that I still think of as neat looking, I had the white cabinet 909X first and then the much more striking(to my eyes)black cabinet 909X after returning the first one due to rock hard buttons. They are both extremely attractive, and exceptionally well made, especially by today’s cheap Chinese standards. I must confess that I also still find the original 909’s almost equally neat looking, though not quite sporting the same robustness of build. I hope this helps, I liked the original review up top, but again its several years old, and the 909X is now known to be clearly outclassed by the more affordable Tecsun, actually by the PL-660 to boot, I really hope Sangean addresses the issues, its such a beautiful receiver, you just want it to be as good as it looks, unfortunately its not.! The sleep timer can definitely be changed on the ATS-909X. It can be changed in 10 minute increments from 90 minutes down to 10 minutes. The issue I mentioned is that the setting isn’t “sticky.” For instance on the Tecsun PL-660 radio once you set the sleep timer to 30 minutes the radio will only stay on for 30 minutes each time you turn it on until you turn off the sleep timer. On the ATS-909X you have to reset the sleep timer to your desired time each time you want to use the sleep timer. I don’t go on vacations so often, so it was no big deal for me. beside this, the Sangean serves me very well, and I find it to be very comfortable to use outdoor. Take Care and enjoy your radio. I use the ATS909 on vacations, as a radio alarm (and for SWLing on the balcony of the hotel room…). The sleep timer can be change (as long as it flashes) with the tuning wheel or buttons, down to 10 minutes. I think that the 909X version should be the same.